Moss Upper Lock No 49 is a minor waterways place minor waterways place place on the waterways major waterways place village town city on the Rochdale Canal between Ducie Street Junction (Junction of Rochdale and Ashton Canals) (11 miles and 6¼ furlongs and 34 locks to the southwest) and Littleborough (3 miles and 3½ furlongs to the northeast). 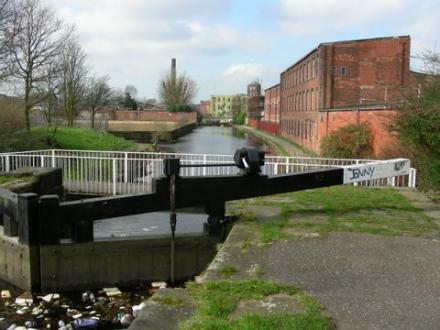 The nearest place in the direction of Ducie Street Junction is Moss Upper Lock Winding Hole; ½ furlongs away. The nearest place in the direction of Littleborough is Walker Bridge No 59; 2 furlongs away. Packer Street, Rochdale, OL16 1NJ — 1330 yards to the northwest. Helmsman Lane, Rochdale, OL16 5PS — 641 yards to the east. 6 Drake Street, Rochdale, OL16 1LU — 1359 yards to the northwest. Rochdale — 1060 yards to the east. Helmsman Lane, Rochdale, OL16 4PS — 641 yards to the east. Castle Hawk Driving Range, Rochdale, OL11 3BY — 1579 yards to the west. Rochdale Exchange Centre, 9-11 Market Way,, Rochdale, OL16 1ED — 1527 yards to the northwest. Sandbrook Leisure Park, Sandbrook Way, Rochdale, OL11 1RY — 1586 yards to the southwest. Rochdale, OL16 4BB — 1528 yards to the east. COCO's House, Queensway, Rochdale, OL11 1TU — 1261 yards to the southwest. 1177 yards to the northwest. The Butts, Rochdale, OL16 1XT — 1424 yards to the northwest. 220 Yorkshire street, Rochdale, OL16 2DW — 1602 yards to the north. The Butts, Rochdale, OL16 1HB — 1447 yards to the northwest. 7 Packer Street, Rochdale, OL16 — 1328 yards to the northwest. Moss Bridge Road, Rochdale, OL16 5PQ — 439 yards to the east. Station Rd, Rochdale, OL11 1 — 736 yards to the west. 1 South Parade, Rochdale, OL16 1LW — 1413 yards to the northwest. Sandbrook Park, Sandbrook Way, Rochdale, OL11 1RY — 1550 yards to the southwest. Rochdale — 958 yards to the west. Rochdale, OL16 1A — 1409 yards to the northwest. 285 Kingsway, Rochdale, OL16 4AT — 805 yards to the northeast. Entwistle Road, Rochdale, OL162HZ — 1292 yards to the north. 271 Olney, Freehold, Rochdale, OL11 4LA — 1412 yards to the west. Rochdale, OL16 1 — 1376 yards to the northwest. 25-27 Yorkshire Street, Rochdale, OL16 1YL — 1547 yards to the northwest. 7 Packer Street, Rochdale, OL16 1NJ — 1315 yards to the northwest. Craiglands, Rochdale, OL16 4RA — 1388 yards to the southwest. 8 castlemere st, Rochdale, OL11 3SW — 1235 yards to the west. Church Lane, Rochdale, OL16 1NR — 1257 yards to the northwest. Sparrow Hill, Rochdale, OL16 1 — 1363 yards to the northwest. 35-37 Oldham Road OL16 5QJ, Rochdale, OL16 5QJ — 887 yards to the northwest. Balderstone road, Rochdale, OL112AJ — 1386 yards to the south. Around the Corner, 48-50 Drake Street, Rochdale, OL16 1NT — 1213 yards to the northwest. Sandbrook Park, Sandbrook Way, Rochdale, OL11 1RY — 1628 yards to the southwest. Sandbrook Park, Sandbrook Way, Rochdale, OL11 1RY — 1585 yards to the southwest. 479 oldham road, Rochdale, OL164UF — 863 yards to the south. Rochdale, OL16 1 — 1283 yards to the northwest. Turf Hill Road, Rochdale, OL16 4XA — 626 yards to the southeast. Unit 3N, Moss Mill Ind Est, Rochdale, OL16 5LB — 211 yards to the east.